Across the sustainability in further and higher education community, there are those topics that continue to crop up. Whether that be due to new research, regulation change or general public awareness. We have pulled together this programme to provide a one-stop shop for resources covering these issues. 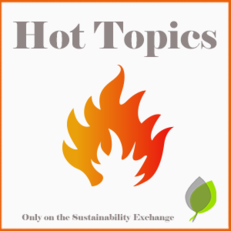 Under each individual topic you will find links to our related resources on the Sustainability Exchange. These include case studies, webinars, reports, minutes and presentations. These resources are collated from EAUC, Further and Higher education institutions and our partners or related bodies. The topic may also have a link to our Member Responses; these are a member-only resource that include a collation of any knowledge exchanged in our members Jiscmail groups, simply log into your EAUC account to view these. If you feel we are missing a Hot Topic or would like us to collate or further investigate resources on any specific topic please contact us. Please browse our Hot Topics in the bar to the left of the page.